Women and people of color were picked for a majority of open S&P 500 board seats this year for the first time, due in part to pressure from investors to improve gender and racial disparities. Investors including BlackRock Inc. and State Street pressured boards to add more women and minority candidates by voting against hundreds of directors at companies not taking sufficient steps to improve diversity. Growing claims of sexual harassment against business leaders have put more women in positions of power. Women and people of color were picked for a majority of open S&P 500 board seats this year for the first time, due in part to pressure from investors to improve gender and racial disparities. 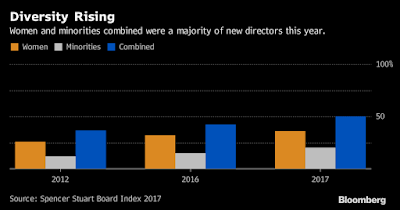 Of 397 independent director slots open in the 2017 proxy season, 36 percent went to women and 20 percent to minorities, according to Spencer Stuart, which has tallied boardroom demographics for 30 years. While the tally includes most board seats, it leaves out executives who are also directors of their companies. Combined, women and minorities made up 50.1 percent of the new board members, compared with 42 percent last year, the data showed. 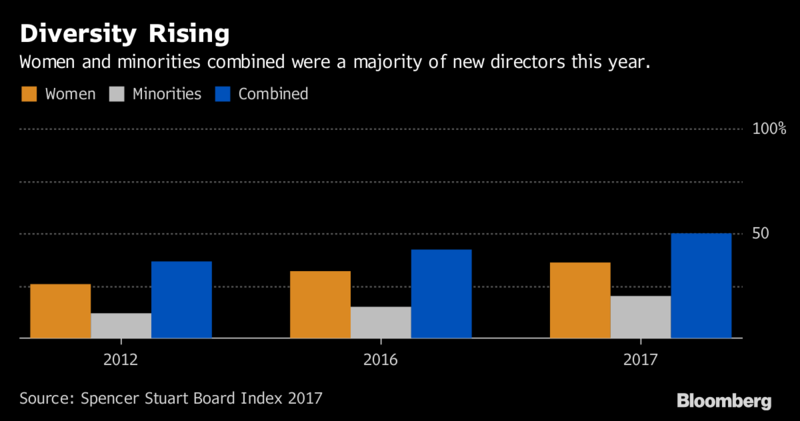 Investors including BlackRock Inc. and State Street Global Advisors this year pressured boards to add more women and minority candidates by voting against hundreds of directors at companies perceived as not taking sufficient steps to improve diversity. In addition, growing claims of sexual harassment against prominent business leaders have increased the focus on putting more women in positions of power to avoid conditions that lead to a hostile workplace. Even with the gains, the low rate of turnover on corporate boards makes progress slow. Fewer than one seat on each S&P 500 board, on average, changed hands last year. With so few openings, women overall crept up to 22 percent from 21 percent of board representation in 2016 and minority directors rose to 17 percent from 16 percent, Spencer Stuart said. The percentage of Hispanic directors fell to 4.3 percent this year from 4.6 percent last year as black and Asian percentages rose slightly. Directors may be reluctant to leave because they’re well paid. Average director compensation rose 1 percent to $288,909 this year. That compares to the U.S. median income of less than $60,000 a year. Also, for the first time, more than half of boards with a mandatory retirement age have set the limit at older than 73 on average, giving directors more time to serve in the future. Boards also still prioritize candidates who have been a CEO or a director at another company, putting women and minorities at a disadvantage because they’re significantly under-represented in those roles, according to a survey this year by Deloitte.